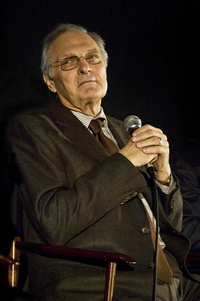 Alan Alda (born Alphonso Joseph D'Abruzzo; January 28, 1936) is an American actor, director, screenwriter, and author. A six-time Emmy Award and Golden Globe Award winner, he is best known for his starring roles as Hawkeye Pierce in the TV series M*A*S*H and Arnold Vinick in The West Wing, and his supporting role in the 2004 film The Aviator, for which he was nominated for an Academy Award. He is currently a Visiting Professor at the State University of New York at Stony Brook School of Journalism and a member of the advisory board of The Center for Communicating Science. He serves on the board of the World Science Festival and is a judge for Math-O-Vision. This webpage uses material from the Wikipedia article "Alan_Alda" and is licensed under the GNU Free Documentation License. Reality TV World is not responsible for any errors or omissions the Wikipedia article may contain.